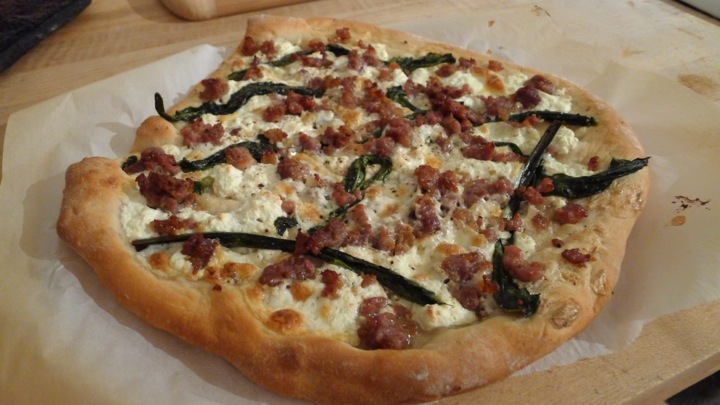 I know I make a lot of pizzas, but I am forever curious about the different kind of funky ones I can make- and 99% of the time they taste awesome, which is a pretty high percentage in pizza land. 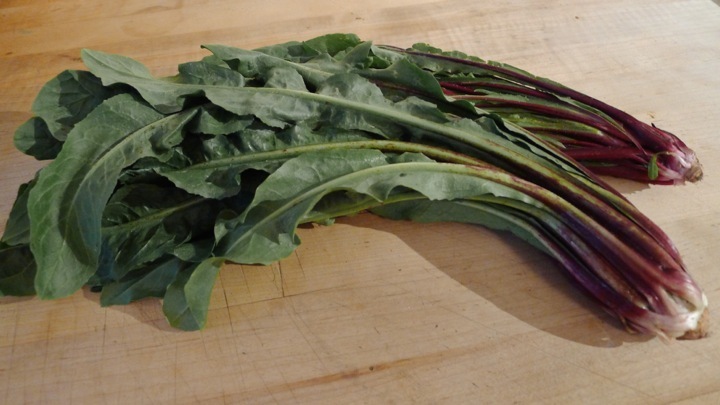 This week I got garlic scapes which I have anxiously been waiting, as well as some dandelion greens which happen to be one of my favorite greens lately…they’re so great just simply sautéed. 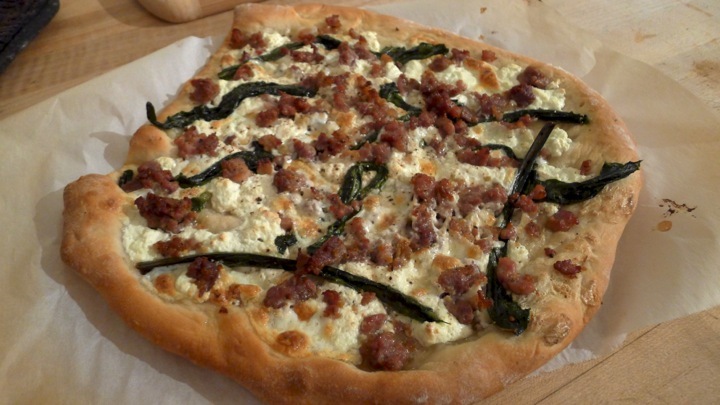 Anyway, I went over to my friend Meghan’s house and cooked us a pizza while we drank a very large bottle of wine. Overall a great night with some great local ingredients! Preheat the oven to 385 degrees. 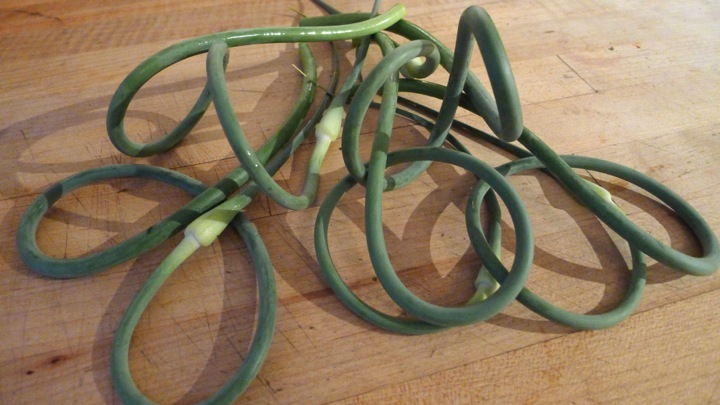 Start roasting the garlic scapes in the oven with a little olive oil for about 10 minutes or until soft, but be careful not to burn them. 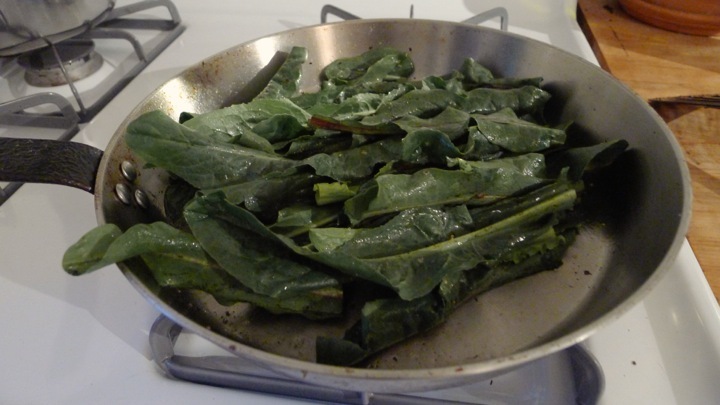 While those cook, sauté the dandelion greens in a skillet with some olive oil, salt and pepper. Set all the veggies aside once cooked. 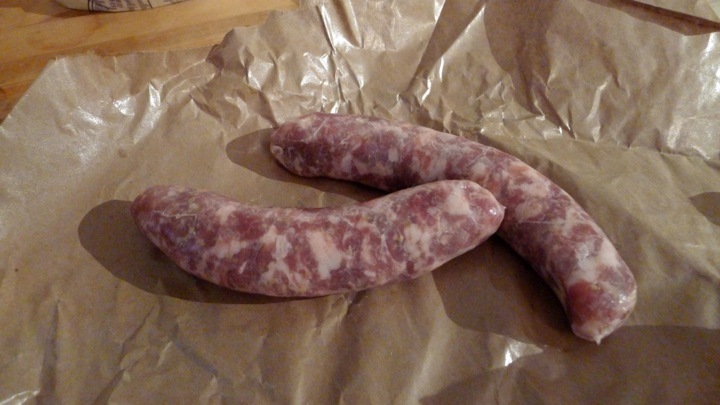 Next, brown the sausage and break it up well into crumbles. 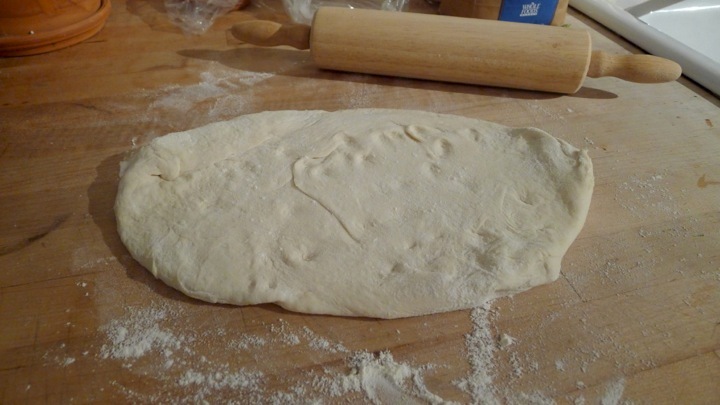 On a floured surface, roll the dough out into a large circle (or two circles if you have smaller pans like we did) To make the pizza, place the rolled dough on a baking sheet covered in parchment paper. 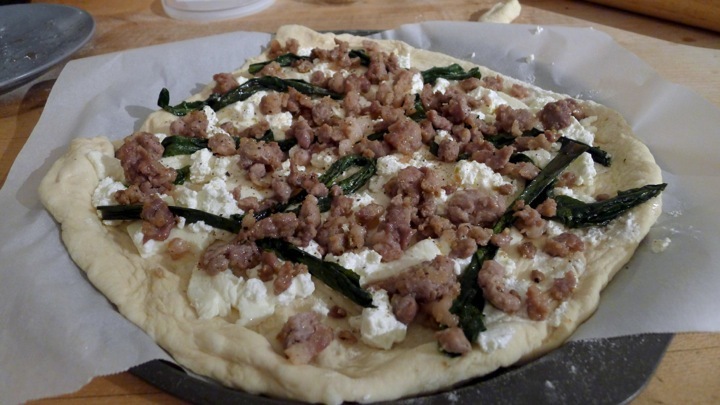 Spread the mozzarella and ricotta all over the bottom, then top with dandelion greens, garlic scapes, and sausage. 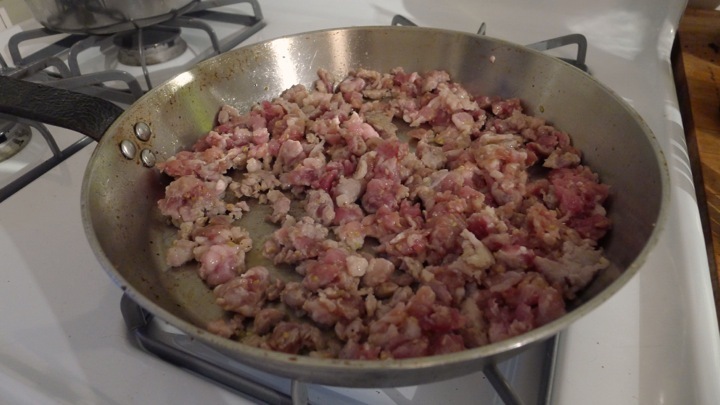 Cook for 20 minutes or until the bottom is golden and the toppings are melted and bubbling. 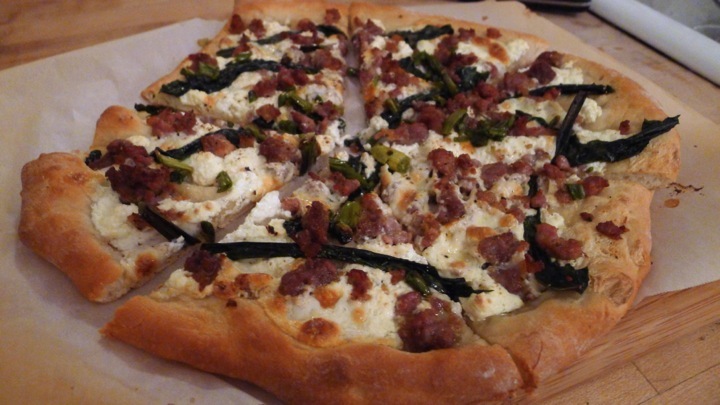 Top with some fresh cracked pepper and a large bottle of wine!